Starbucks is putting its best foot forward after bias training. Will it last? "An afternoon of training won't erase what's in a person's heart," a Starbucks customer in Philadelphia said. 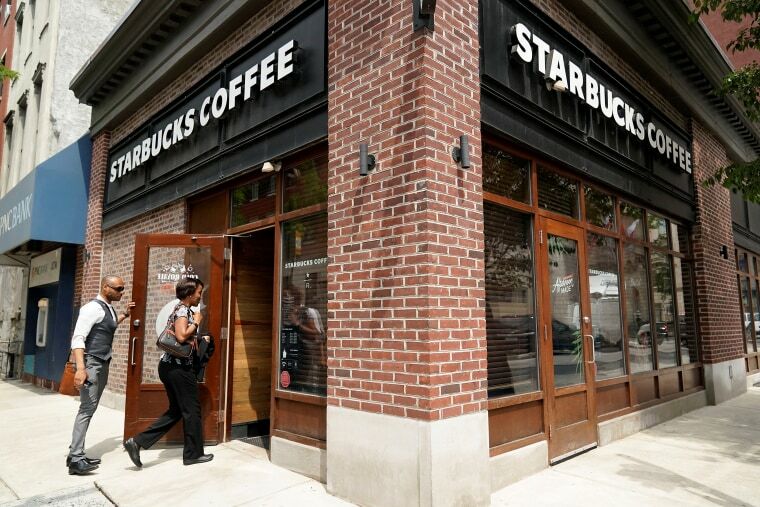 PHILADELPHIA — On the morning after more than 8,000 Starbucks across the country closed for an afternoon of racial sensitivity training, Brandon Dixon ordered his usual at the Rittenhouse Square store — a venti-size Emperor's Cloud and Mist green tea — and paused while considering whether the customer service had noticeably changed. The baristas were still friendly, but their pleasantries came with extra pep — not just to him but to everyone who walked through the door looking for a boost of caffeine. "How are you today? It's a little overcast, but it will be a great day!" "God bless you," a barista said after a customer sneezed. When a construction worker from outside walked in without making a purchase and asked for a code to the bathroom, a barista quickly obliged, adding, "You're welcome." This was the same Starbucks where last month two black men were arrested while waiting for a business associate after a white manager called police — an incident viewed by many as an overreaction to a nonthreatening situation. After the arrests, protesters marched in Philadelphia, city officials apologized and the Seattle-based coffee giant decided to hold Tuesday's anti-bias training for about 175,000 employees. Dixon, who is black, said the initial incident came as a surprise to him as he is a regular in the Rittenhouse Square location, where he had always found the staff friendly. He said Starbucks' response, including overhauling its bathroom policy to allow customers to use the facilities without ordering anything, felt genuine. "Starbucks got it right — they owned it right away," Dixon, 35, said. "But how long will it last?" That question was asked Wednesday by other customers at other Starbucks across Philadelphia. Many agreed that the company's decision to shut stores to talk about racism was admirable, while also wondering if the move would actually change anything. "An afternoon of training won't erase what's in a person's heart," said Nicole Williams-Burton, 48, who is black, and was grabbing a caramel frappuccino from a Starbucks in Center City. "Some of these employees are going to work — they're just going through the motions. They have to be willing to want to change, and that doesn't come easy if deep inside they feel a certain way about certain groups of people." Starbucks' training was devised with the help of the Perception Institute, an anti-bias research and advisory group, and with input from civil rights groups, including the NAACP and the Equal Justice Initiative. The Rev. Al Sharpton, the civil rights activist who is also an MSNBC host, visited Starbucks' headquarters last week and met with executives. "I said that this is not about sitting down with civil right leaders and writing a check — this is about you've got to deal with the culture in your store," Sharpton said Tuesday afternoon at a town hall on racism hosted by MSNBC in Philadelphia. Starbucks' four-hour session included showing employees a video featuring the hip-hop artist and activist Common, who spoke about the importance of accepting people's differences. Another video by documentary filmmaker Stanley Nelson Jr. included people of various races and ethnic backgrounds describing how they feel like they're being watched when they enter a store or are fearful they're being judged based on their race. Starbucks employees also did group exercises and took tests to help them understand the concept of implicit bias, which involves the automatic assumptions people make about others based on race, gender or other identifiers. Some Starbucks employees in Philadelphia declined to talk about Tuesday's training when approached by NBC News, but Starbucks CEO Kevin Johnson said Wednesday on Fox Business Network that it remains "one step in a journey ... it's not just a one-time thing." The company plans to hold ongoing training sessions, though without closing stores. Elaine Cheung, a Philadelphia immigration attorney who goes to Starbucks daily, said the company will be better for it. She said the arrest in the Rittenhouse Square Starbucks, where she stopped for a coffee Wednesday, was wrong, although she personally feels comfortable there. "If those two men were 100-pound females and Asian-American, then I guarantee that wouldn't have happened," Cheung added. She hopes Starbucks will inspire other companies to start conversations with their employees about race, though she noted that customers also need to speak up about injustice. "The same way you had the #MeToo movement and the fall of Bill Cosby, there has to be something that makes people realize racism is not approved behavior and you're going to get called out on it," she said. "Starbucks started something for a day, and I commend them, but this is not just about Starbucks."